NielsenWire has just published their latest online video metrics report and as expected like it has been the past couple of years, YouTube is still the most visited online video site. 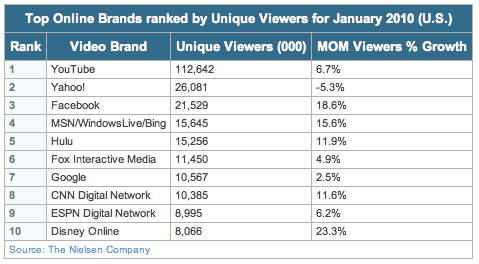 But what’s interesting to note from Nielsen’s stats is how fast Facebook is growing as an online video channel. First, some facts and details. According to the NielsenWire’s report, the number of unique viewers of online video increased y 5.2% year-over-year, from 137.4 million unique viewers in January 2009 to 142.7 million the same month this year. And the fastest growing online video sites include the likes of Disney Online with 23.3% growth, MSN/WindowsLive/Bing with 15.6% and of course Facebook with 18.6% growth during the said period. YouTube on the other hand managed to posed only a 6.7% growth but it still remains at the top of the list with a commanding 112.6 million unique viewers. Now, as I said, it’s quite interesting to note how fast Facebook is growing as a video channel. It only goes to show that more Facebook users are sharing online video as well as watching them online via Facebook. What is ironic about this is that most of those videos were actually embedded from the YouTube site. Perhaps, Google has not yet noticed this trend especially since YouTube continues to be the number 1 online video site. But at the rate that Facebook is growing, it might just be a matter of time before it catches up with YouTube. Unless of course Google does something to prevent this from happening. Hopefully Google won’t do something drastic in the future. I think youtube is a great tool for anyone interested in watching or uploading videos. I have been using the site for years now, and still think it is doing a good job. Ok, so sometimes it gets criticized for being too easy to break copyright laws, but youtube’s online security is getting better. The best thing about the site is its great video search engine and database. No wonder it made it as the top sharing site on http://www.dozenvideo.com this month. But there’s some tough competition out there and as online video gets bigger and bigger, there’s sure to be a backlash. Keep online videos free and easy to share!